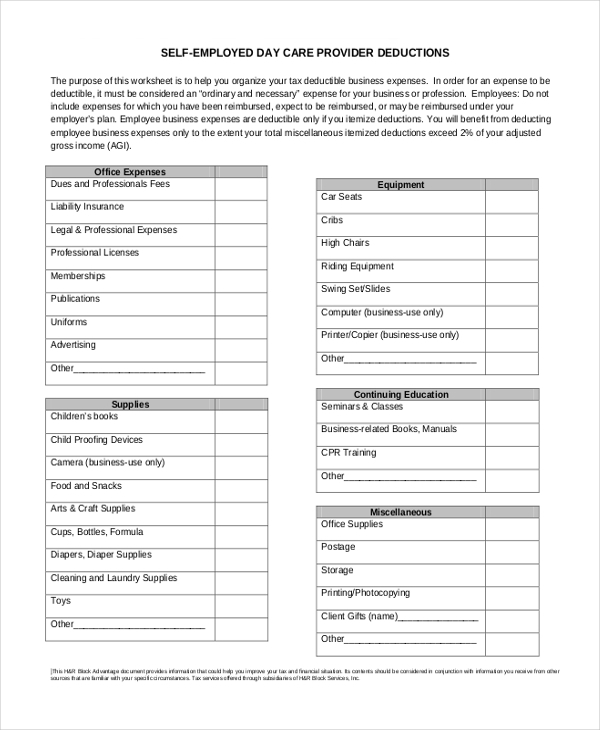 A business expense form is a type of a form which highlights, in detail, every kind of expenditure that has been incurred by a person in any kind of activity. Every person, while doing some kind of an activity incurs various expenditures. This particular form is used simply to record all such cost of expenditure for the reimbursement purpose. Starting from travel to children’s day care business, the form is available for every kind of purpose. This form is considered to be a legal proof of the various expenses incurred by an individual. The details which are added in this form are supported by the original bills by which a person can get the reimbursement done. You may also see Business Consent Forms. This form is mainly used for reimbursement of money. If a particular person, working in an organization, travels somewhere, he needs to submit an expense to the company for reimbursing the amount which has been spent on traveling. The form contains every detail like the identity of the person, date of the journey, transportation availed, meals consumed at different times in a day and each and every fact and figure of the journey. Along with this, all the original receipts needs to be submitted to the organization for the process of reimbursement. An employee of a company can claim reimbursement from the company over the amount spent by him on an official tour. The company is bound to give back the amount. In this case, a reimbursement claim needs to be submitted to a particular authority in the company. The reimbursement claim contains detailed information about the expenses incurred in the business tour, like the personal information of that individual and details of the various receipts. An employee fills an employee business expenses form in order to deduct ordinary and necessary expenses. An ordinary expense is one that is common and accepted in your field of trade and the necessary expense is the one which is helpful and appropriate for your business. This is a type of a form, which is needed to claim moving expenses of an individual. The form has four parts. The first part is about the information of the individual; the next part is about the distance covered while traveling. The third part of the form consists of the details of the travel and the 4th part which is the final part contains the calculation of the entire moving expenses. 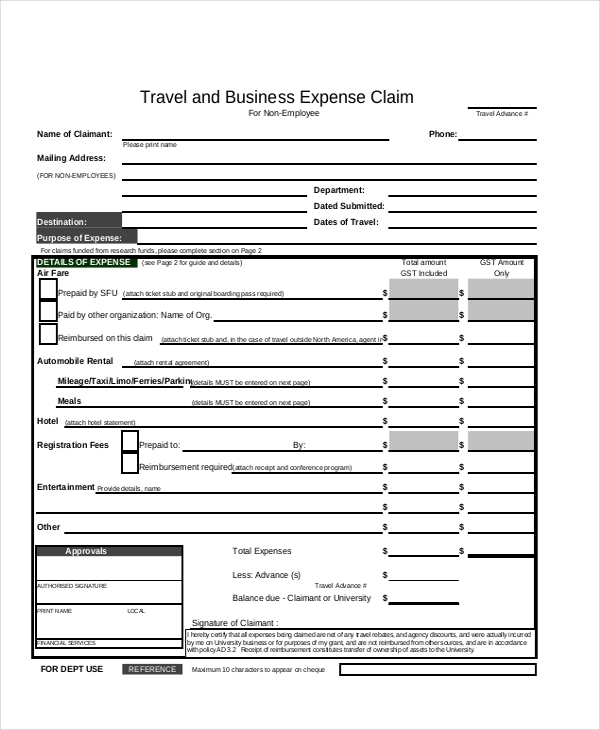 It is a type of a form which is used to claim the return of expenses incurred during travel. Just like the other expense forms, this also includes various elements like the details of the claimant and along with that the complete record of the travel expenses. 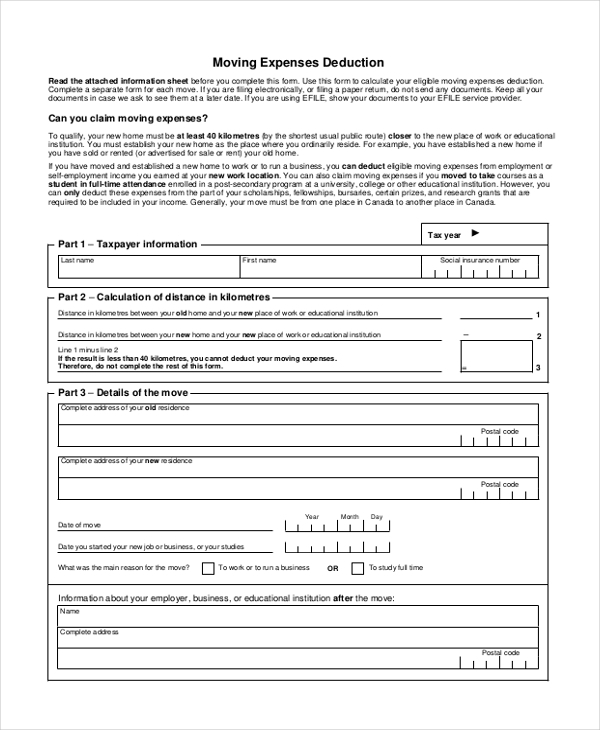 This particular form has a section which tells the claimant to fill the purpose of the travel. This is a type of a form which contains in details each and every expense made on a child. The expenses are calculated on the basis of every day over a week. The various types of expenses which need to be filled in this form are the three meals, the accessories needed for the child like school uniform, school books, toys etc. 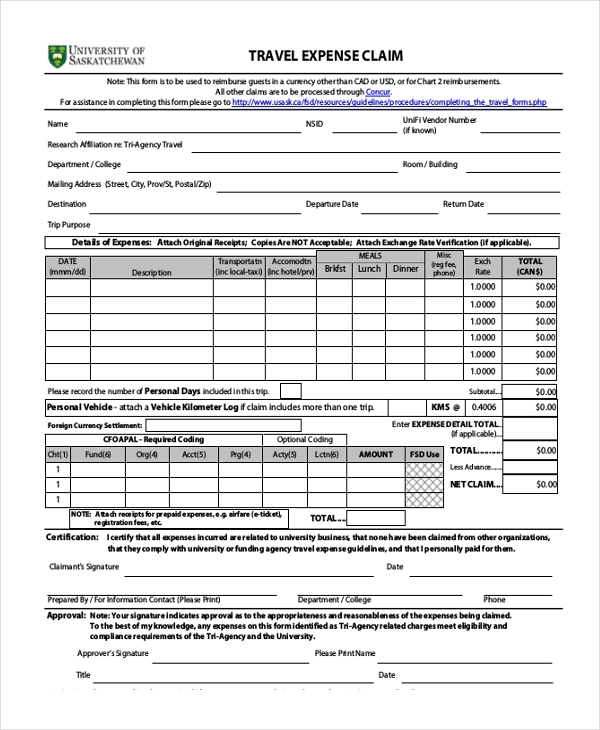 This is a type of a form which is used to keep records of the various day care business. The form includes details for day care meetings, shopping trips, banking, education, taking children home or to the doctor. 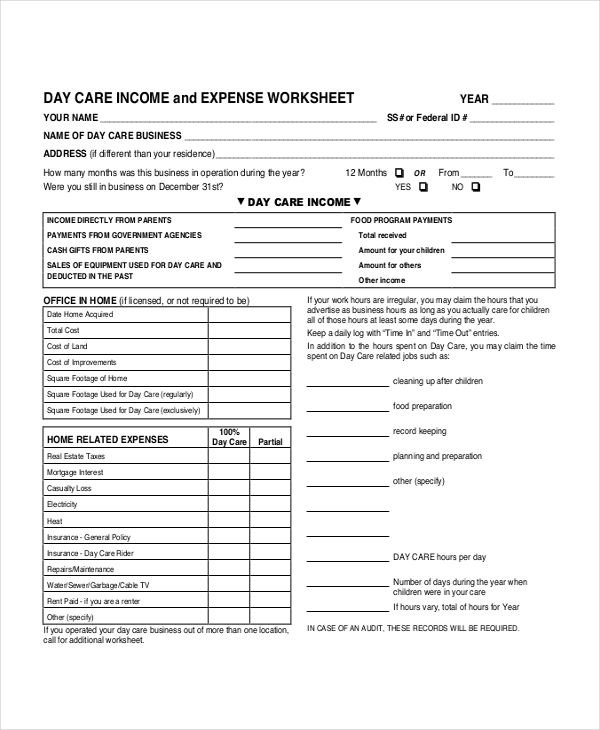 In short, all the day care expenses are included in this form. This is a type of form which contains details of the business activities taking place in a house. A home or a house can be used for various business purposes. So, this particular form gathers every detail of the business operated from home. The form is divided into four parts. The first part contains the details of the home used for the business, the next part is about the allowable deduction and the third part consists of the details of depreciation of the home. At the end, the carryover of extra expenses needs to be filled. What is a Business Expense Form? In every kind of business activity, there is an expense which is incurred by an individual over a period of time. The expense is naturally subjected to reimbursement. In the case of reimbursing, a business expense form along with the various bills and receipts get submitted to the organization. The form is the most important document for the purpose of reimbursement. It contains every minute detail of the expenditure. Based on the information provided in this form, the compensation process takes place from the part of the organization. Useful Business Financial Statement Forms. A genuine proof- This particular form is the most important proof for an organization to reimburse the expenses incurred by an employee. The details of the various expenses are produced in the form. An easy method of reimbursement- The form makes the process of reimbursement easy. 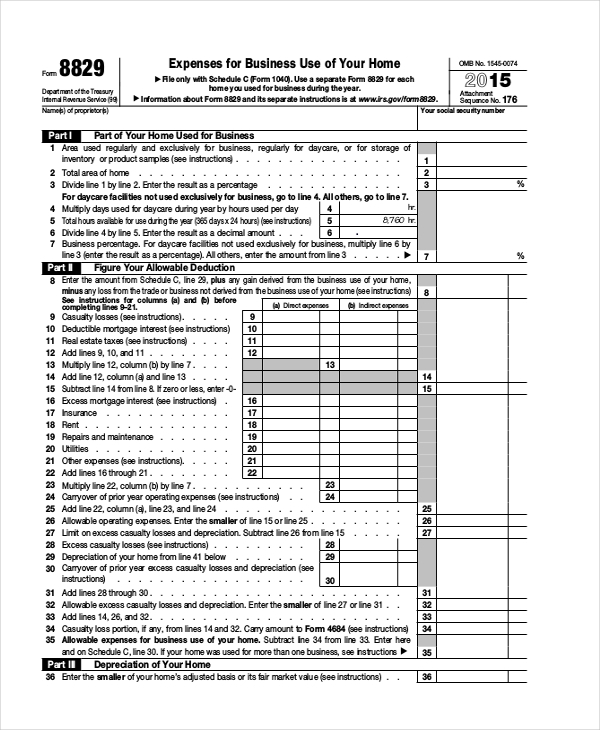 The details in this form are supported by various bills and receipts. Not at all time consuming- With the advent of this particular form, the reimbursement process gets completed within a limited time. This form helps the most in calculating the various costs of repayment. It is a recorded statement- The form helps to maintain an expense record for the organization. This maintenance of record is very important for future purposes and even to keep a check on the accounts. People who travel due to office work- People who travel for the sake of office work need this particular form the most. Only after filling this particular form with every detail of expenditure can the amount be reimbursed from the organization. People who have a child to look after- In this case, there is a particular form called Child Care Business Expense Form. Every person who has a child can actually fill up every detail of the child’s expenditure starting from the food till the school uniforms. This helps in getting back the money on child expenses. A person who has his own business- A person who has his own business also needs this particular form for various purposes. There are various activities in a business which is required to bear expenses. 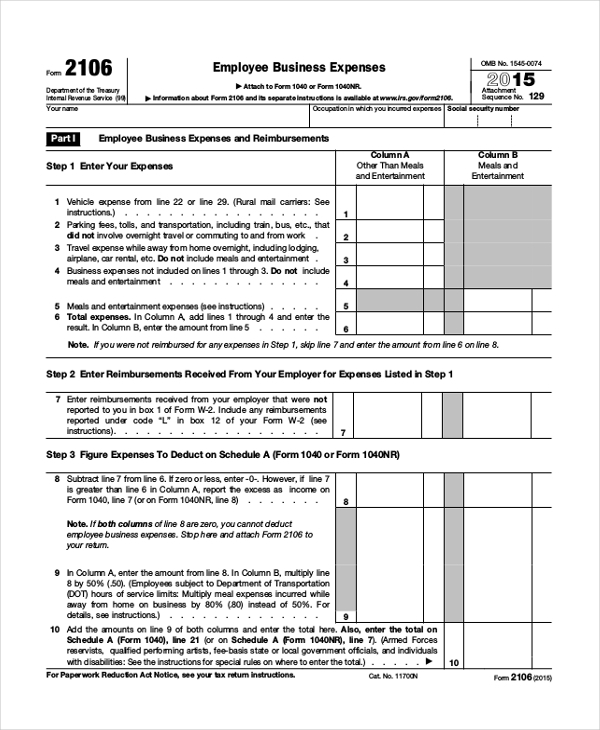 This form also helps many businessmen to keep track of their expense record. Why Would You Use a Business Expense Form? A business expense form is used for various productive purposes. The main purpose which it solves is the reimbursement of money from the organization. Each and every expense incurred by an individual needs to be reimbursed from the company with the help of this form. The form acts as a catalyst in order to get back the money from the company. Not only travel expenses but the form helps in various other expenses like child care expenses, day care business expenses, home business expenses etc. This particular form acts as a legal document for the expenditure of an individual for any particular work. 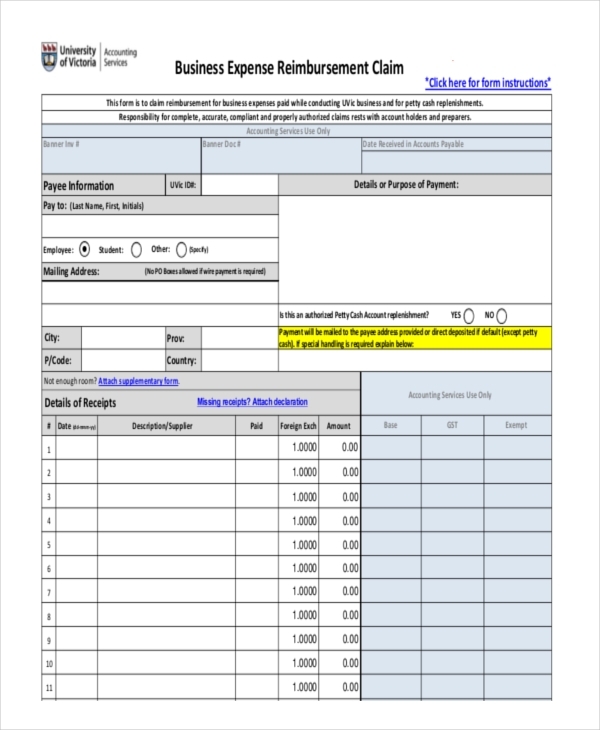 The Business Expense form is now available both in the word document and in PDF on our website. All the forms, which serve various purposes, are printable and customizable. A person can download any form and edit it according to his or her requirements. The various templates on our website are quite popular among the customers all over the world. The entire sample list will be of a great help for any individual who needs it. The company will be happy to receive feedback from the customers. You can also see Customer Complaint Forms. Every type of transaction needs a particular document for its successful completion. In the case of reimbursement, a business expense form is the most vital document without which the process of repayment cannot be done. The form contains each and every detail of the cost incurred by an individual and based on that the company reimburses. Around the world, mostly, all the companies, irrespective of their size use a business expense form to ensure a smooth process of reimbursement.